The Fieseler Storch is the most famous slow-speed aircraft of the Second World War. A remarkably versatile reconnaissance plane, as well as a Nazi showpiece and diplomatic gift - and even, in post-war British hands, a tool in helicopter design - it was linked to some of the best-known personages of the conflict: Hitler, Speer, Rommel, Mussolini, Churchill and Stalin. 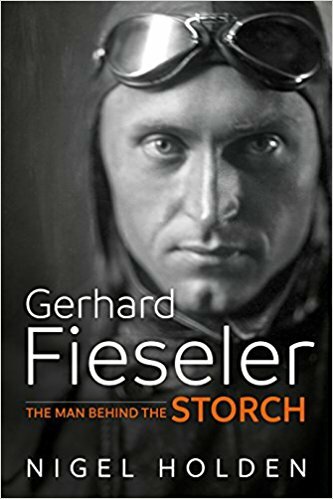 Furthermore, as Nigel Holden suggests in this first complete biography in English of Gerhard Fieseler (its creator), no other plane had a comparably equivalent role in that war. Making use of Fieseler's own autobiography and other material never reproduced in English, Holden chronicles Fieseler's life against four distinct, interlocking German contexts: the Reich of the erratic Kaiser Wilhelm II; the unloved years of the Weimar Republic; the Nazi era; and the anxious Federal Republic. He also traces Fieseler in the context of aviation development in the first 50 years of the 20th century. As a boy, Fieseler was obsessed with aircraft and air-mindedness (the idea of harnessing airpower for nation-building purposes); the First World War gave him the opportunity to fly for the Fatherland. In the 1920s, he gained international fame as an aerobatics pilot - becoming world champion in 1934. His considerable earnings were invested in a small aircraft company, which became under the Nazis (who had ideas of air-mindedness of their own) a favoured supplier to the Luftwaffe. Fieseler's company became regarded as among the very best in Germany, in terms of technical capability and the integration of Nazi ideals into factory life. Gōring appointed Fieseler to his inner circle of Germany's top industrial leaders and, during the Second World War, his company manufactured under licence Messerschmitt 109s and Focke-Wulf 190s. Fieseler - according to his own account - was the driving force behind the development of the V1, which is widely regarded as the forebear of the cruise missile. Holden's biography argues that Fieseler may well have been a better fighter pilot than the renowned Richthofen and reveals some uncanny parallels between his life and that of Germany's greatest wartime aircraft designer, Willy Messerschmitt, as well as describing his time as an indicted war criminal and his subsequent quest for post-war respectability. Fieseler emerges as an audacious fighter pilot, an heroic aerobatics pilot, an inspiring industrial leader (for a time), a Nazi opportunist, a not always reliable memoirist and an obstreperous old man who, to the end, blamed Hitler - and largely only Hitler -for provoking the Second World War.